The Kestrel Sportsman Weather Meter combines accurate measurement of air density and wind with a powerful ballistics calculator to deliver precise elevation and windage solutions for any gun, any round, any shot. The built-in enhanced Applied Ballistics G1/G7 ballistics solver is tested and trusted by long-range hunters and shooters. Optional LiNK connectivity powered by Bluetooth Smart® provides wireless communication to mobile devices and computers. and integration with LiNK compatible laser range finders for improved speed and accuracy. 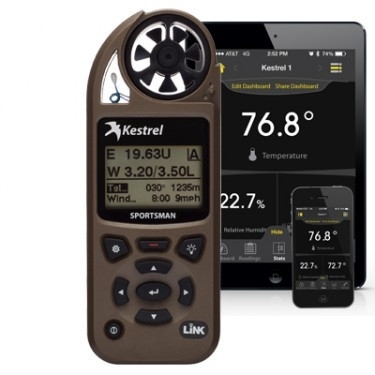 The Kestrel Sportsman is a tremendous value in full-featured ballistics calculators with trusted accuracy and reliability. 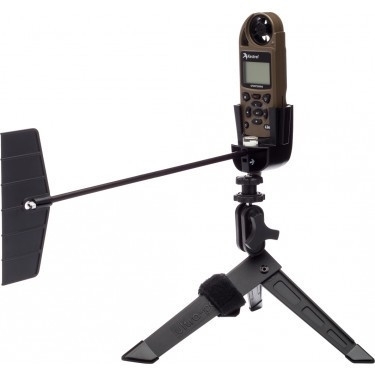 This integrated weather meter and ballistics solver takes the guesswork out of long-range shooting and is an ideal companion for hunters and shooters working within the supersonic flight range of their bullet. 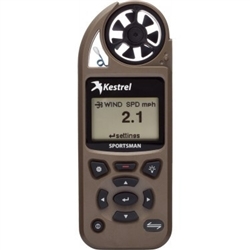 In addition to the ballistics solver capabilities, the Kestrel Sportsman is a comprehensive weather meter for measurement and logging of primary environmental conditions: wind speed and direction, temperature, humidity, heat index, pressure and altitude. Paired with the Vane Mount, the Kestrel Elite becomes a compact, easily-deployable weather station. Your data log can be transferred to a mobile device wirelessly with the LiNK wireless communication option and Kestrel LiNK app, or to a PC (no Mac Software) with our waterproof USB Data Transfer Cable (available separately).